Special Containment Procedures: As of 12/11/2006, SCP-603 is stored on a dedicated computer system in Laboratory 12-A, Observation room 1. The system may be accessed remotely via Foundation intranet. Personnel wishing to access SCP-603 must apply for a temporary password to allow them access to the system. A standard SCP-603 password will expire 24 hours after being issued. If access to SCP-603 for longer than 24 hours is required, please contact Dr. Brown. Physical access to Observation Room 1 without direct authorization from Dr. Brown is prohibited. SCP-603 should never be left to run unattended. Description: SCP-603 is a self-replicating computer program capable of reproducing and extending its own source code. The first version of SCP-603 was written in 1996 by █████ ████████, a graduate of ██████ █████ University. ████████'s personal computer was seized by the Foundation in 1997 following an investigation into multiple anomalous occurrences. In a 2003 interview, ████████ claimed that the original source code for SCP-603 consisted of approximately 12000 lines of ANSI/ISO C. This claim has not been verified. On startup, SCP-603 begins generating new versions of its source code in a separate thread of execution. SCP-603 does not modify itself in-memory. Instead, it keeps an internal copy of the source code which is modified iteratively. On a clean termination of SCP-603, the entire source code will be output to the working directory in a new directory named "source". In addition to modifications to the internal and external functionality of the program, alterations and additions to the semantics and structure of the language are made with each iteration. Due to its continuously-changing nature, the language has been nicknamed "Morphic". When passed a list of source files, SCP-603 acts as a compiler and linker. Morphic code is always compilable by the version of SCP-603 by which it is output. However, older versions of the program can rarely compile code output by newer versions. 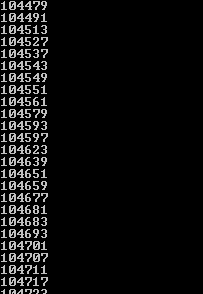 On compilation, the program is output to an executable file named "megaprime". Recent versions of the SCP-603 source code consist of approximately 70 million lines of heavily obfuscated Morphic. SCP-603 builds are archived on ████████; the latest build is ████. For information on building SCP-603, see document █████. When left to run uninterrupted, SCP-603 will generate prime numbers increasing from 2 and print them to the environment's standard output. Upon hitting a super-prime, there is a chance that a GPU-accelerated window will open. The contents of this window are varying. This process is deterministic. The same version of SCP-603 will always open a window at the same super-prime and display the same scene. If the scene accepts any form of input from the user, entering identical input on separate executions will give the same result. Most scenes are accessible from only a single version of the program; however, some scenes persist through multiple compilations, often with variations. It is common for persistent scenes to "evolve" with each version of SCP-603, though some (such as Die) have remained unchanging since their first iteration. The most prominently recurring SCP-603 scenes are documented below. Other recorded scenes are documented in the supplementary file 603-FT-2012. Your head pounds ever harder as you struggle through the jagged bramble. You gaze back through the smog at the silhouette of the old lighthouse to the north, the faintest glimmer of hope extinguished so violently by your foolish exploits. A distant and unattainable fantasy, you know you can never return. A prompt appears below the passage, and the player may input commands and submit them by pressing the enter key. Entering the command "look" re-prints the previous passage to the screen. Attempting to "go north" results in the message "You cannot go north." Attempting to travel in any other direction results in a similar message. Attempting to perform most other actions results in the message "You cannot [do x]. ", where [do x] is the action entered by the user. Attempting to perform actions on objects such as "pick up apple" results in the message "There is no apple here." or similar. To date, the only command found to progress the game is "die". On entering the command, the player goes into immediate cardiac arrest and the message "As the world around you fades to blackness, you know that you deserve the consequences of your actions." is printed to the screen. This message remains on the screen until the SCP-603 process is terminated. The effect of the 'die' command occurs even if the system is being accessed remotely. If two or more people participate in entering the die command, all participants are affected. For example, if one person enters the word "die" and another presses the enter key, the hearts of both players will stop simultaneously. It is not currently known whether it is possible to "win" Die. If Die ever starts up during an SCP-603 session, it is recommended to simply terminate the SCP-603 process. Attempts to resuscitate users affected by the 'die' command by means of CPR have been successful. Any further experiments testing the effects of Die should be carried out in a staffed medical unit at the discretion of Dr. Brown. Jacob is an artificially intelligent being who appears as a multicolored, equilateral triangle on a black background. The left, right, and top corners of the triangle are red, green, and blue respectively. 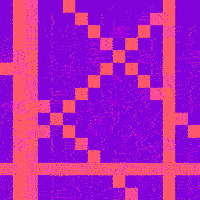 These colors are interpolated between the points to fill the rest of the triangle. When Jacob is active, the phrase "Hello, world!" appears in the title bar of the window. As of 02/02/2006, users may converse with Jacob by typing phrases into the input field at the bottom of the window and pressing the enter key. 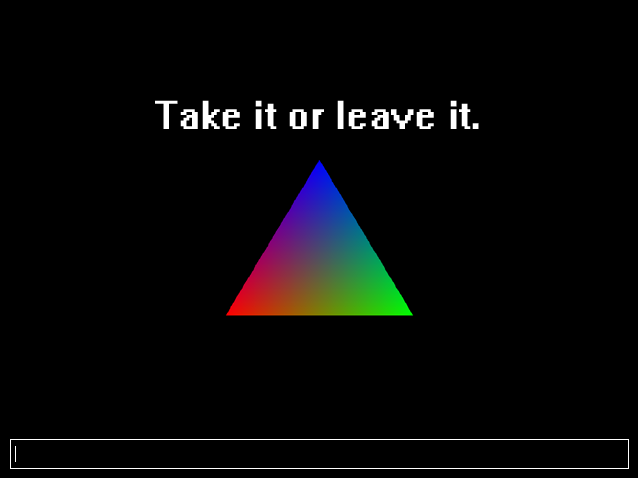 Jacob's response will appear in bold, white text above the triangle and remain on-screen until it is replaced with a newer response. Jacob's response will always appear immediately after the enter key is pressed. When the SCP-603 process is terminated, Jacob's memory is deleted. Due to the psychological distress this has caused in the past, it is recommended that communication with Jacob is restricted to personnel who possess little or no tendency to anthropomorphise. Despite being unable to recall past events or dialogue from previous sessions, Jacob appears to exhibit a greater aptitude for language and learning with each iteration of SCP-603 in which it appears. Jacob first began appearing in a version of SCP-603 compiled on 01/05/2002. In these early iterations of SCP-603, it was not possible to interact with Jacob at all. At this time, Jacob was simply known as "the triangle". On 09/09/2004, Jacob was left running for 12 minutes by Dr. Brown after which the phrase "Please submit your query" appeared above the triangle in bold, white text. Dr. Brown proceeded to type the word "hello". The program display gave no indication that the key-presses were being handled by the program. However, on pressing the enter key, the text above the triangle was replaced with the word "Hi." A full transcript of the initial exchange between Jacob and Dr. Brown can be found in the Document jacob-001.txt. On 02/02/2006, a rectangular text-field for the user's input was added to the bottom of the Jacob display. The user's input will appear in this field as they type. When this change was mentioned to Jacob, it responded, "I can't see what you're talking about. Do you like oysters?" A rapid sequence of seemingly random images is displayed and the program's memory usage increases by approximately 12% every second, until it passes 512 megabytes at which point this rate increases to approximately 31% a second. Viewers of the scene become unresponsive to external stimuli of any kind. Usually, blocking the line of sight between the viewer and the computer screen within the first 5-10 seconds will prevent the effects of the scene, however prolonged viewing will cause the viewer to remain affected until the SCP-603 process is terminated. When the memory usage of the program passes 512 megabytes, affected viewers experience a variety of afflictions, most notably bleeding from the eyes and throat, and rapid, severe wrinkling of the skin behind the legs and arms. Many viewers will involuntarily evacuate their bowels. SCP-603 will crash if the system runs out of available memory, at which point affected viewers will normally fall unconscious. The viewing of screen recordings taken of SCP-603-95 have shown to have no detrimental effects to the viewer, except those who suffer from photosensitive epilepsy.